This topic contains 3 replies, has 2 voices, and was last updated by Alexander Bautz 9 months, 1 week ago. I’ve setup a table chart listing documents in a library and there are two types of document, XLS and XML files. I would like to setup a filter to filter to view to all XML, all XLS or all. I tried a static filter and used “*”, “*xml” and “*xls” and this doesn’t work, I hoped the wildcard would work with text after it. Is there a syntax issue or will it just not work as I expected? 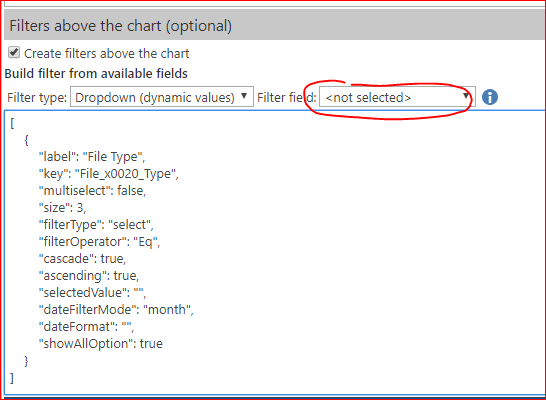 You must use the “File type” field for filtering – select it from this dropdown as shown in the attachment. Flipping heck, I never even noticed that option !!! thanks for pointing it out.